Based on the very popular American model Dog Day Care is very quickly becoming more popular here in the UK. Those of us who love our dogs but have to be at work all day, experience constant worry about our pet..
Is he receiving enough mental stimulation? Often the answer is no. At home alone all day dogs get bored, lonely and unhappy leading to behavioural issues, such as over excitability, barking and destruction of the home. Dog Day Care is designed to address your worries! Day Care is wholly intended to meet all your dogs’ needs. We are there to love, entertain, exercise and care for your dog. 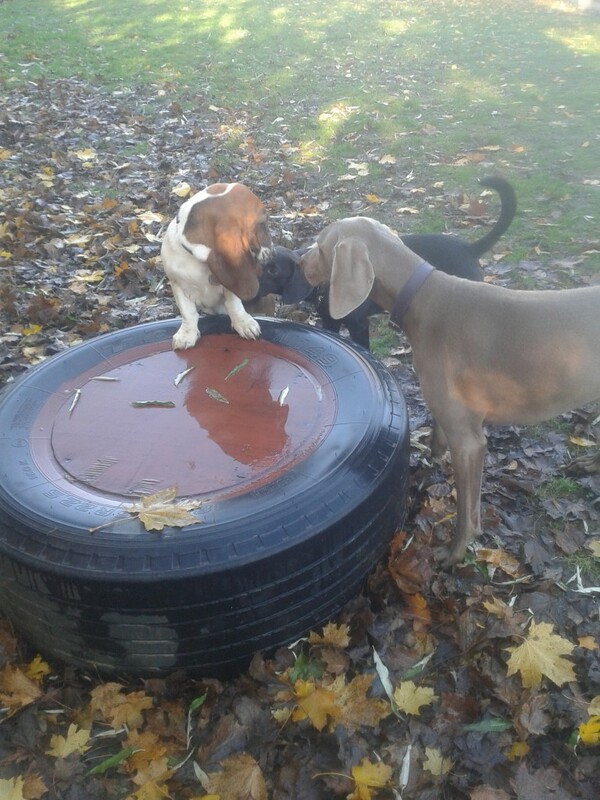 Dogs play together in open indoor play areas and outside in our two large, fully enclosed garden areas. The dogs are under constant supervision from trained and experienced dog handlers. The Dog Day Care centre is custom designed for dogs, meaning it is secure, free from hazards, fun and comfortable, allowing all the needs of your dog to be met. Rest areas, included large floor cusions, sofas and crates, are provided to allow the dogs quiet time and rest. We are only too happy to take on puppies and young dogs, and can crate them for rest/sleep periods is specified by the owner (Note: dogs that are not crate trained will not be crated, although many opt to go in them for a snooze!). A mixture of free play and structured play entertains the dogs, using different toys and games, inside and out in the secure gardens. Basic training is reinforced at all times and at your request, each dog can have basic training in obedience on a one to one basis. We also do basic daily grooming and handling of the dogs giving them one to one attention. We administer medication if required and prescribed by your vet. Regular pictures of your dogs playing and resting at Day Care are uploaded to facebook, so you can see all the new friends your dogs are making and see the fun that they are having with us! You will be assured of the fun that your dog has with us by his reaction when you pull up outside the centre in your car. 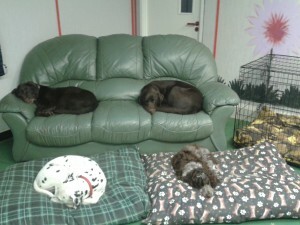 Dogs LOVE coming here, and you will be picking up a tired and very content dog at the end of the day. Remember, Dog Day Care is so much more than just a walk!! We provide constant company, socialisation with other dogs, play and lots and lots of love! The video below shows a selection of dogs that attend daycare, all of varying breeds, ages and sizes, all in open play in our outside area. All the dogs are sociable and love being in the company of us and the other dogs. They run, play and general have a great time with us. What dogs are suitable for day care? Not all dogs suit dog day care. Day care is not suitable for all dogs. Those who settle most easily have had regular interaction with other dogs, have lots of energy and love company of people and canine playmates. Dogs who don’t get on with other dogs or who are very nervous are unlikely to be happy in day care and so a very comprehensive assessment is undertaken to ensure the attendance is right for your dog. Each dog that is registered will undergo a trial period to ensure they are happy and benefit from their visits. See requirements to see if your dog is suitable.